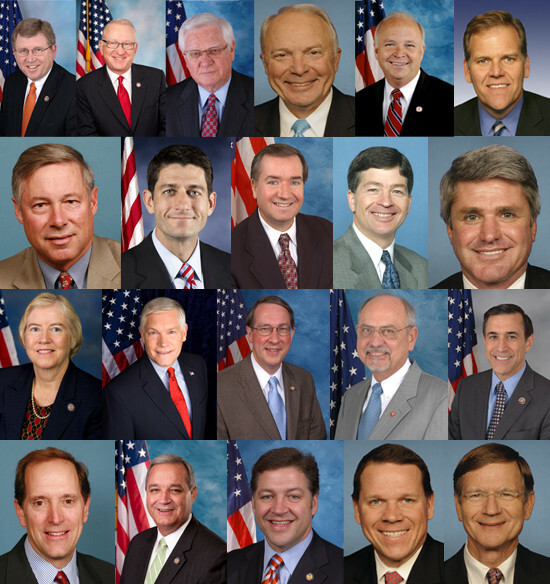 Republican Chairpersons of the twenty-one House committies. If “the Environment” names a primary sacrament and object of veneration for the church of politically correct self-congratulation, its demonic opposite is the allegation of racism. Just as one can never be sufficiently green and sensitive to “the Environment,” so one can never be sure one has escaped the unforgivable sin of racism. What is racism? It is too important a weapon in the armory of leftist ideology to be defined. Definition would limit its deployment, and the whole point of blanket condemnatory terms like racism is that they be all-purpose, unlimited badges of ostracism. “Racism” occupies a place in contemporary left-wing ideology much like the place occupied by “bourgeois” in Marxist ideology. Its very vagueness is part of its attraction. To call something “bourgeois” was to place an unredeemable deprecatory minus sign in front of the offending person, group, or institution. Likewise “racism” and its cognates. To say someone or something is “racist” is to pronounce anathema upon it. No more need be said. Sam Tanenhaus, the editor of The New York Times Book Review, provides a vivid illustration of the use and abuse of racism in “Original Sin: Why the GOP Is and Will Continue to Be the Party of White People,” his long and tendentious cover story for the February issue of The New Republic. Or perhaps we should say the new New Republic. For Tanenhaus’s essay helped inaugurate the magazine’s rebirth as a boutique leftist organ under its new owner, the Facebook millionaire Chris Hughes. As Martin Peretz, owner of The New Republic for thirty-five years, banefully noted in an op-ed piece for The Wall Street Journal, Tanenhaus’s essay demonstrated that The New Republic had “abandoned its liberal but heterodox tradition and embraced a leftist outlook as predictable as that of Mother Jones or The Nation.” “Original Sin” is a curious, not to say obnoxious, literary production. It is part of a much larger, and distinctly non-literary, effort to discredit and ultimately to destroy not just the GOP but the tradition of Constitutional restraint and limited government which have provided the party’s intellectual foundation. The theme of Tanenhaus’s essay is announced in its subtitle: the GOP is inextricably the party of white guys, i.e., racists. Its deeper purpose, however, is signaled by its arresting title: the racism of the GOP is not remediable. Original sin is not the product of something one does but something one is: being human, in the case of Christian theology, being Republican if you are Sam Tanenhaus. What makes “Original Sin” so odd is its historical legerdemain. When it comes to racism, the elephant in the room for Democrats is the unhappy historical fact that the Democratic Party was the party of slavery in the nineteenth century, the party of segregation for much of the twentieth century, and the party of multicultural neo-segregation today. Tanenhaus does not put it quite like that, but his essay slyly acknowledges the first two items. When it comes to contemporary realities, however, he argues that conservatives, by opposing identity politics and supporting the ideal of limited government, have slid under the wheels of history. The changing demographic complexion of America, he says, has consigned the GOP to bitter irrelevance. Searching for an intellectual paterfamilias for this drama, he settles on Lincoln’s great antagonist John C. Calhoun. The reasoning goes something like this: Calhoun supported states’ rights and limited government. He worried about the tyranny of the majority. He also supported slavery. Conservatives support states’ rights and limited government, they worry about the tyranny of the majority, ergo they are racists. What can one say? The philosopher Sidney Hook was right that “as morally offensive as is the expression of racism wherever it is found, a false charge of racism is equally offensive, perhaps even more so, because the consequences of a false charge of racism enable an authentic racist to conceal his racism by exploiting the loose way the term is used to cover up his actions.” This is not the first time that Sam Tanenhaus has endeavored to provide an epitaph for the GOP and conservatism. Back in 2009 he wrote a long essay, which he later expanded into a book, pronouncing “The Death of Conservatism.” Months later, the Tea Party reinvigorated the conservative base and turned the mid-term election into a rout for Democrats. But historical accuracy is not part of Tanenhaus’s brief. Like “The Death of Conservatism,” “Original Sin” is an attempt at political demolition masquerading as journalism. It tells us a lot about The New York Times in its present configuration that the editor of its book review should be the author of such an intellectually dishonest, politically mischievous, and morally repellent essay.